By using the Copyright Information feature on Setup Menu 4 of the Canon Rebel t5i, you can add copyright information to the image metadata (extra data) recorded with the image file. You can view metadata in the Canon software. Including a copyright notice is a reasonable first step to prevent people from using your pictures without permission. Anyone who views your picture in a program that can display metadata can see your copyright notice. Obviously, that won’t be enough to completely prevent unauthorized use of your images. And technically speaking, you hold the copyright to your photo whether you mark it with your name. But if you ever come to the point of pressing legal action, you can show that you did your due diligence in letting people know that you hold the copyright. You can create copyright data only in these modes. However, the data is stored with all images you shoot, whether you take them in the advanced or fully automatic exposure modes. 2Display Setup Menu 4 and chose Copyright Information. You see a screen with Copyright options. This step opens the data-entry screen. 4Enter your name in the text box. Your fastest and easiest option is to use the touchscreen-enabled keyboard: Just tap the letters you want to enter. Tap the symbol labeled Caps/lowercase/numbers to switch the keyboard from displaying all uppercase letters, all lowercase letters, or numbers and symbols. To move the cursor, tap inside the text or tap the arrows at the end of the text entry box; to erase a character, tap the Erase icon. 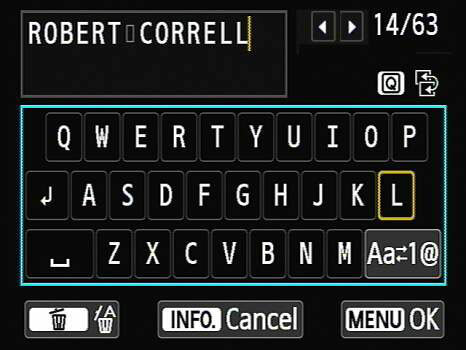 Press the Quick Control button to alternate between the text box and the keyboard. 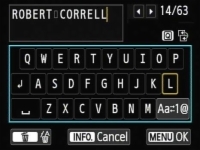 In the keyboard, use the cross keys to highlight the character you want to enter. Then press Set to enter the character in the text box. In the text box, use the cross keys to move the cursor. 5Tap the Menu icon or press the Menu button. You see a screen saying that your text will be saved. You see the Copyright Information screen. 7Choose Enter Copyright Details and enter additional copyright data. You might want to add the word Copyright and the year, for example, or your company name. Use the same text entry process you used to enter your name. 8Tap the Menu icon or press the Menu button. Wait for the camera to save the additional data. Back you go to the main Copyright Information screen. 10To check the accuracy of your data, choose Display Copyright Info. Double check the copyright notice. 11Exit to Setup Menu 4 by tapping Menu twice or pressing the Menu button twice. You can later disable the copyright tagging by using the Delete Copyright Information option.